acting for the social good to benefit our present and future stakeholders. At Concentric, these three elements are important considerations when devising our long and short term strategy and Concentric Business Excellence plays a critical part in attaining our sustainability goal. In this article, we interview Jerry Rumple, Continuous Improvement Manager at Rockford who explains how we have achieved an enviable level of business excellence at Concentric Rockford. 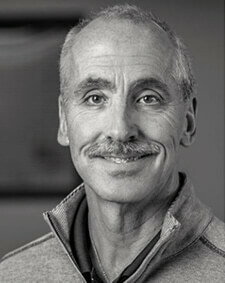 Jerry, you play a key role in facilitating Concentric Business Excellence, what does your role entail? 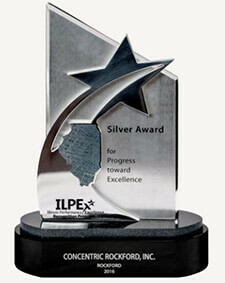 You recently coordinated a very successful application on behalf of Rockford to be considered for the prestigious Baldrige/ILPEx Award – receiving ILPEx Silver Award for Progress Toward Excellence from this rigorous assessment. Can you tell us a little more about this? Why do you feel so passionately about participating in the external ILPEx assessment? Results (such as customer quality, On Time Delivery (OTD), satisfaction/engagement, operational performance measures of Overall Equipment Effectiveness (OEE), first time pass, employee healthcare costs, as well as financial results). Using a strict scoring system, a team of 8–12 examiners independently reviewed and evaluated our written application for performance and improvement against external benchmarks and best practice standards. Their key findings included an assessment of Rockford’s strengths and opportunities. Our application was strong enough to qualify for the next stage which was a rigorous site audit lasting 4 days. The 8 on-site examiners interviewed 124 employees and reviewed hundreds of documents and data to clarify and verify information provided in our application, including the extent to which we deploy and integrate our management systems. They also sought proof that we proactively and systematically review, evaluate and improve our systems and processes. A detailed Feedback Report was prepared by the Examining team which was reviewed by a Panel of Judges to ensure consistent calibration in scoring and application of the ILPEx criteria. The Judges hold several meetings to review all applicant Feedback Reports and to determine the appropriate level of recognition based on the profile of strengths and opportunities for improvement reported. After such a thorough process, it will not surprise you to learn that the Feedback Report is incredibly valuable for us and it helps to inform future improvement planning. How does this award benefit our stakeholders? What do you see as the challenges ahead for continued improvement? How does the Concentric Business Excellence model support our goal for sustainable working practices? “That’s easy! Environment: our Environmental Management System (EMS) is continually evaluated and improved such that our products and operations positively impact our customers, suppliers, employees, and community. Social: we continually evaluate and improve our key approaches when it comes to employee health, safety, accessibility, and security. Economic: one of the main criteria we apply to any process improvement activity is that it must deliver improved results and align with our financial goals. You can’t have good processes and process results without showing good levels and sustained trends in key financial results.